Waldron believes that good design means more than just having a beautiful home. “When you walk into someone’s home, you should feel as if you’re surrounded by the things that are most important to that homeowner,” Waldron says. When Michael DuPre hired Waldron to “jazz up” his 1500 sq. ft. townhome, he just wanted to replace old kitchen cabinets. DuPre, a jazz enthusiast who loves bold colors and the city of New Orleans, enjoys entertaining but the layout and decor of his home held him back. Waldron, who believes in minimal impact design, says, “If something is still beautiful, why toss it in a landfill?” In that spirit, she consulted with DuPre and decided to start small, selecting a light grey tone for walls as a backdrop for bold color. Waldron saw there was wasted space in the kitchen. The open floor plan of the first floor lacked continuity. The foyer needed a refresher. According to Waldron, a half wall of wooden spindles in the living room had to go. The lower level lacked personality and her client’s kitchen needed to be reconfigured to accommodate DuPre’s penchant for entertaining. Waldron suggested her client replace a peninsula in the kitchen with an island to improve flow. Now guests can walk around the kitchen without bumping into walls. She selected a colorful granite countertop with notes of amber, rust and cream, streaked with deep wine red. To create a cohesive look on the first floor and to reflect the colorful and fun-loving personality of her client, she chose a wine red cork floor throughout. “Cork is a sustainable, easy-to-live-with flooring that provides rich color and texture,” Waldron says. Her client selected a rectangular charcoal grey sink—made from recycled composite— to offset the bright tones of the room. Amber glass pendant lights hang above the island to create a warm glow. To bring the outside in—a view of Calm Lake—Waldron combined cool blues and neutrals in a mosaic backsplash that reflects the water theme. She plays warm tones against cool for a dynamic color statement. The homeowner chose custom cherry cabinets and the rich, natural look of hardwood—handmade by Harmut Deeg—with burnished copper pulls to add warmth. A burnished copper faucet finishes the look. For design inspiration, Waldron headed to the basement where she uncovered a Mardi Gras-themed poster. References to jazz and New Orleans are sprinkled throughout the home. A wall sculpture of jazz musicians sits above a reconditioned fireplace. The designer carried the water theme downstairs to the great room by reclaiming fishing lures—now hung from hooks in the hall— and vintage fishing photos. “I like to reuse and repurpose old things. Those “gems” in the basement or attic hold personality. They bring a home to life,” she says. Conventional wisdom states that upgrades and renovations increase the value of a home. But the reality is that all home improvement projects aren’t created equal—some pay off better than others. Before planning your major projects or giving your contractor the go-ahead on that pricey home makeover, consider thinking small instead of big. Why? The fact is you can’t always count on recouping your investment, especially if you decide to splurge on an upscale kitchen with custom cabinets and high-end appliances or a spa-like bath with luxury finishes. According to Remodeling magazine’s 2015 Cost vs. Value Report, an annual national survey comparing the price and resale value of rehab projects, the more you spend on a project, the more you are likely to lose. Spare-no-expense kitchen projects, in particular, only returned as little as 69 percent of the total amount spent on them. Surprisingly, the survey found that simpler, lower-cost projects netted the biggest paybacks: upgrading to a steel entry door recouped almost 102 percent of its cost; replacing wood, vinyl or composite siding with stone veneer paid back 92 percent; and minor kitchen remodels that included cabinet refacing, laminate countertops and new appliances provided a 79 percent return on investment. That said, here are eight small to mid-range projects that could pay for themselves—and then some—even if you’re not planning to sell anytime soon. Paint offers dramatic results with little investment, especially if you do it yourself instead of hiring a professional. Small changes in the kitchen not have a large impact, they offer the biggest bang for your buck. Think resurfacing kitchen cabinets or replacing olod hardware. Installing a new sink, faucet, appliances and quality but not over-the-top expensive countertops (natural stone counters like granite have dominated the market for a while, but cheaper, durable materials like laminate are making a comeback) can make the entire space feel brand new. New counters, vanities and fixtures (faucets, sinks and toilet), along with updated wall tile and flooring always provide solid returns. When it comes to curb appeal, the front of your house is the first thing people see, so it only makes sense to give some attention to your landscaping. A well-maintained lawn and flowers, shrubs and trees all make a property attractive to potential home buyers down the road. More than a place to soak up the sun and have cookouts, decks provide a smooth transition from indoors to out that is appealing to homeowners, guests and future buyers. For many people, there’s no bigger turn-off than the dreaded damp-basement smell, so a clean, dry underground space can pay dividends. If your basement is prone to moisture, consider using a dehumidifier. If there are leaks or flooding, call in a pro. If you decide to finish your basement with insulation, drywall, laminate flooring or a bathroom, make sure the quality is on par with your upstairs living space. Give your garage a makeover with a door replacement generally pays for itself while making your home more attractive and secure. Even a fresh coat of paint on the doors and entire structure can work wonders. Vinyl and fiber-cement siding are almost maintenance-free options that improve both the look and energy-efficiency of your home while providing a solid return over time. Looking for ways to save money on energy costs? First let’s look at your home’s heating and cooling. As much as half of the energy we use in our homes goes to heating and cooling. Smart choices about heating, ventilation and air conditioning mean big savings. -About 30% of your total home energy costs is spent on heating your home. Follow this tip: get your heating system inspected before heating season begins. Heat loss from a poorly-maintained system adds up fast. Clean or replace your furnace filter often. Your furnace uses a lot less energy when filters are replaced regularly. Make sure that registers and air return ducts aren’t blocked by furniture or carpets. Ceiling fans, when set on a low setting, help push warm air down from ceilings to more evenly heat your home. -Try not to overheat your home to avoid overworking your furnace. If your furnace needs replacing, look for one that’s at least 90% energy efficient. A key to energy efficiency is a programmable thermostat. When programmed correctly, your home’s thermostat will automatically raise the heat before you get out of bed in the morning, then turn it down when you go to bed at night. The optimum temperature range is 68 degrees while you’re at home and 65 degrees when your away. If you install a programmable thermostat before winter sets in, you can look forward to a 20% savings on heating costs the first year. Follow a simple rule of thumb: for every degree you turn down your heat, expect to save 1% to 3% on energy costs. -The cumulative effect of small leaks in your home has the same effect as leaving a window open all year long. To save money, you can use inexpensive expanding foam or caulk available at a hardware store to seal cracks in areas where cold or warm air escapes like windows and door frames and around holes in walls where pipes enter and exit your home. -More than 50% of the energy we use for winter heating escapes from our homes because of uninsulated walls, floors, ceilings and attics. Check your insulation. Insulation, judged by R-value, has one rule of thumb: the higher the R-value, the better the insulation. Consider adding insulation in your attic. It’s a cost-effective way to reduce heat loss. -Window treatments can prevent heat from escaping too. Drapery with an insulating liner cuts heat loss by half. Installing storm windows can also cut your heat loss by half. Look for double or triple-pane windows. -When cooling your home with central air, clean leaves and debris from your outdoor unit. Anything that’s too close to a compressor will block airflow. Make sure your central air conditioning system is the right size for the area you want to cool. Clean your filter regularly. Your air conditioner works harder if filters are dirty. -Set your cooling thermostat to 78 degrees during the day and even higher when you’re away. Install an attic fan. An attic fan reduces hot air trapped in your attic and prevents it from sinking into rooms below. -Operate appliances like your dishwasher, dryer and oven in the mornings and evenings because they can add heat to your home and that makes your central air work harder. -Homes with light or white roofs require up to 40% less energy for cooling than those with black roofs. Studies show you could save at least $120 per year in cooling costs if you install a light-colored roof. -Your water heater accounts for about 14% of your average utility bill. Set your water heater temperature to 120 degrees to cut bills without sacrificing comfort. Keep your hot water hot by making sure pipes in unheated areas are insulated. Put an insulating blanket around your water heater to hold heat in. -Maintain your water heater by draining the tank once a year. Turn the incoming water on and off—for about 20 seconds each— to clear. This flushes minerals and sediment from inside the tank to make your water heater run more efficiently. -Many state and local governments and utility companies offer financial incentives for homeowners to upgrade their appliances to newer, more energy efficient models. Incentives usually take the form of rebate checks for homeowners who can provide proof of purchase. –Energy Star®, the partnership between the EPA and the U.S. Department of Energy, identifies energy-efficient products and rates them. Make sure your major appliances are Energy Star® and check their rating. A frig with freezer uses more energy than any other appliance in your home. Upgrade your refrigerator to an Energy Star® model, then set the refrigerator’s thermostat between 38 to 42 degrees and your freezer between 0 to 5 degrees. Condenser coils remove heat from inside your refrigerator. They need to be at least two inches from the wall. Clean them twice a year. -When selecting lighting, LED bulbs are cooler and use less energy than halogen or incandescent bulbs. A 40-watt LED bulb uses only six watts of power, which is 85% less energy than a standard light bulb. LED bulbs can be more expensive to buy but are well worth the investment. Depending on usage, a single bulb can last up to 20 years and costs only 72 cents a year to operate. -Install dimmer switches and three-way bulbs wherever possible. They’ll use less energy and you’ll have a choice of task lighting in different areas of your home. Take advantage of the reflective nature of walls and light colors. Position lamps in corners so light bounces off two walls instead of one. Place furniture near windows to use natural light, whenever possible. -For outdoor lighting, try high-pressure sodium bulbs. They’re more efficient and last longer. -To conserve water, equip your kitchen with an easy-to-install aerator to minimize wasted water and boost water pressure. An aerator allows you to direct water flow where needed for washing and rinsing food or dishes. -Toilets account for nearly 30% of an average household’s water consumption and even more if they’re leaky. High Efficiency Toilets (HETs) can help you reduce the amount of water you use. HETs combine high efficiency with high performance. An HET uses 20% less water than a standard 1.6 gallon-per-flush toilet while maintaining full flushing power. -The average American family does almost 400 loads of laundry every year. Energy Star® washers and dryers help cut energy use by up to half, and water use by over 30%. -Think solar. Global Solar portable solar panels are an innovative way of taking free energy from the sun and convert it directly into electrical power that can be used to power electronics or charge batteries. These panels eliminate the need to use outlet power that’s often generated by burning fossil fuels. –Kill-A-Watt power meters can help you understand which appliances and electronics use the most energy around your home. This meter is designed to empower you by providing information you need to make decisions about energy use. Remember, knowledge is power when making smart choices for energy use in your home. The more you know, the more you can save. If exposed beams, roof lines and skylights excite you, an attic conversion may be the ticket to expanding your living space while adding value. Though attic conversions require some planning, the increased value of a finished loft is well worth the effort. The top floor of your home can be converted into a spectacular master suite that becomes a private getaway for just the two of you, a quiet home office, or decked-out media room. Consider adding a dormer window to increase natural light and air circulation. Dormers create space for built-ins and storage and can add height to a cramped space. Envision your new loft space with skylights for an airy, open feel. Skylights bring in more natural light and a view. Or create a gabled ceiling below the roof to draw attention away from the structure above. Every attic is unique, but a few established practices can guide you to a more useable space. Whether your house is suitable for an attic conversion depends on a number of factors including your home’s layout, available attic space, roof pitch and type of construction. Enforcement varies but a ‘Rule of 7’s’ applies to attic conversions. Codes say that at least half of a finished attic must be 7 ft. high and that this area must be a minimum of 7 ft. wide and at least 70 sq. ft. A contractor can help you assess how regulations apply to your attic and which modifications are required to bring the space up to standard. Hire an engineer to inspect your home’s foundation and framing to ensure that it can handle the extra load a finished attic will create. You may need to strengthen your attic’s floor joists, which can be too shallow or spaced too far apart to handle more load. Rafters also will need to support drywall, lighting, electrical, plumbing, and HVAC components. A careful review of your floor plan will help determine the best place to build stairs. Staircases with straight runs are easiest to construct but take up a lot of area. If your building a staircase from scratch you may want to try a switchback layout. It needs a little more room than a straight run but the footprint is square rather than linear, so it will fit in spaces where a straight staircase can’t go. Make sure your landing is large enough to bring furniture upstairs. For an attic bedroom you’ll need a staircase that meets code. Here are a few tips to consider when envisioning the possibilities for your new space. Plumbing fixtures are available that allow you to build a bathroom almost anywhere in your new room. Remember, an attic bedroom requires both a window and a staircase to the level below. For added storage, a closet conversion into a staircase area is a good choice. You might be able to use the space under a new staircase for storage too. Have fun with finishes for walls and ceilings. Beadboard panels—in a tongue and groove design—are easy to install, add interest and protect a low ceiling from dings and dents. V-groove wood paneling is another option. When unfinished or stained, wood paneling makes an attic with a low ceiling feel cozy. Vary the look by using boards of different widths. Whitewashing walls and ceilings then adding paneling gives your room a clean, chic, New England feel. Choose fitted pieces that can work with the geometry of your space for maximum effect. Use the slope of your attic roof to your advantage. Select fixtures and products designed to complement sloping ceilings and uniquely-shaped rooms. Challenge yourself to come up with space-saving placements to use every inch of space. Furniture placed centrally, in front of a window, under the highest point of the eaves, creates an elegant, symmetrical look. With a little ingenuity and some space planning, an attic conversion is a quick and easy way to add a unique and cozy room to your home. Remember, your home already has a foundation and a roof. So finishing an attic can be just a fraction of the cost of an addition or new construction. If you’re lucky enough to have an attic that’s still untouched, it’s time to make better use of it. Converting loft space can not only provide much needed extra space, but when your project is done well, can provide real financial rewards when it’s time to sell your property. Follow these simple guidelines to transform your attic from empty space to a charming, chic retreat. Environmental designer, Dani Polidor, owner of Suite Artistry, an interior design firm with offices at Barn Bazaar in Pittsford, prides herself on coming up with out-of-the-box solutions to her clients design needs. Whether it’s a fire engine red, custom-designed, U-shaped bar like the one in Dani’s office or an artfully-inspired accent wall of lime green cabinets, Polidor’s design statements are tastefully integrated into clean, sophisticated design. Her European roots shows in the materials, appliances and fixtures she sources. Born in Germany, growing up in Toronto and here in Pittsford, NY, since 2006, she brings an eclectic sensibility to her unique design skills. A kitchen redesign she took on recently in one example of the rare yet thoroughly modern materials she selects. “I sourced pear wood, smoked oak and bird’s eye maple from Aurora, NY, for a contemporary kitchen remodel for active empty nesters in Pittsford who love to entertain in their kitchen,” Polidor says. “A rosewood granite countertop was used for a two-tier 3’ X 10’ island with a sunken 6” X 60” Kohler trough sink. Just behind the island, a second island of black granite called Blue Butterfly—it features tiny blue dots— adds more work space and another area of interest,” she says. Polidor selected a two-tier island to conceal glasses and empty bottles when entertaining. “I’m always thinking about functionality when I’m planning a space,” she says. Polidor and her team knocked out a wall between the kitchen and dining room to reconfigure the space and concealed a post in the pantry to create the open feel in this upscale redesign. A travertine porcelain tile floor—24” X 24” tiles installed at a 45 degree angle—gives the space a clean feel. Warm tones of wood and granite throughout are finished with modern accents: a glass top table, industrial blue dining chairs and contemporary Italian bar stools with formed oak seat and square chrome base. Polidor installed a sliding glass door to replace a window enhancing natural light in the room. Elongated LED pendant lights over the island, hidden speakers and a SONOS home automation system were added. She also remodeled the couple’s powder room and laundry room just off the kitchen to complete her redesign. The powder room features an oversize pedestal sink and crystal light fixtures for added bling. Suite Artistry provides custom cabinetry and millwork and is a supplier of Miele appliances. From dining furniture to custom closets and soft lighting, Polidor helps her clients discover the right combination of style, material and color. -Try a sustainable product such as a low-flow faucet with aerator and restrictor as a good first step in your kitchen. Water usage is reduced from 2.5 gallons per minute down to 1.5 in low-flow faucets. -The reduced flow will be almost undetectable. Aerators force air into the water stream to maintain pressure and rinsing efficiency. -Great design while preserving the planet can be achieved in the bath too. Water-efficient showerheads optimize water flow without compromising performance. A water-efficient showerhead’s 1.5 gallon per minute flow rate uses 30% less water. Eco-performance tub and bath faucets reduce water usage by 32% on average. -Replace a standard 1.6 gallon per flush toilet with a high-efficiency model to reduce water usage by 20%. If you’re replacing a pre-1994 model with a high-efficiency model, you can reduce water usage by 60% or more. -To cut down on your home’s carbon footprint and reduce energy costs, select Energy Star® appliances. Induction or gas top stoves are 85% more energy efficient than electric. -When selecting lighting, install LED lights. LED lights keep your rooms cool and require less electricity. -Insulate your home with wool, cotton, soy-based, even denim insulation. These eco-friendly materials hold in heat or cooling efficiently and because they’re non-toxic, they’re much easier to install. -For heating, geothermal and solar are rated highest as eco-friendly options. Geothermal systems use earth heat— typically between 45 and 75 degrees—as a base for home heating. The system works using buried coils that contain liquid—typically, a mix of water and antifreeze. The liquid is warmed to the same temperature as the earth and then runs through to your house where a compressor extricates the heat. No fossil fuels are required for this type of home heating. -Passive solar heating systems align building features using the building’s orientation to the sun to reduce heating needs. The three categories of passive solar heating: direct gain, indirect gain and isolated gain convert sunlight to thermal energy to keep a home warm and comfortable. -When remodeling, select local materials when possible to lower your environmental impact. Rochester, New York has plentiful hardwoods—oak, chestnut and maple— that can be locally-harvested. Consider reclaiming hardwoods and choose recycled tiles, whenever possible. -Wood is a beautiful and clean building material with excellent wear-resistance properties. Not only is it hypo-allergenic but often free of chemicals. When finished properly, it’s easy to clean and maintain. -When considering which countertop is best for you, try Corian. It’s 100% recyclable. Corian is seamless and was invented in Buffalo, New York. -Quartz is another great option for countertops because it can be recycled and has the look of marble—with the same pattern and polish— though easier to maintain. -When choosing cabinets, look for manufacturers who use sustainable construction practices and materials that are sourced in Rochester, New York or its surrounding counties. -If you’re painting walls, select paint with low or no VOC’s—Volatile Organic Compounds—especially if you’re chemically-sensitive. VOC’s have high vapor pressure at ordinary room temperature so large numbers of molecules evaporate and enter the indoor air you breathe. -For flooring, consider engineered floors made of thin veneers sandwiched on top of one another—or even luxury vinyl—that can have the look of wood or tile. Both are worry-free options. -Recycled ceramic or porcelain tiles are also good flooring choices. Try natural cork for an unexpectedly luxurious feel. Cork comes in a wide variety of colors and its soft finish is easy on your feet. -To save time and money while being eco-friendly, repurpose and recycle items you already own. Vintage parts make great hardware for cabinets. Reclaimed corbels under a kitchen countertop can make a space your own. -Stay warm this winter and conserve on heat with a heated floor. If it’s a new build, a hydroponic system will allow your domestic water to run through a heat pump so it does double-duty. In radiant floor heating, channels or tubes under the floor are warmed by warm water. Some radiant floors are warmed by electricity, and others, by air movement. -Hydroponic systems are most popular but require the system be hooked up to a water heater or boiler. Electric radiant floors are much simpler to install and maintain. They work through cables beneath the floor, or through mats that conduct electricity. -The advantage of an electric radiant floor is that it comes with its own thermostat so temperature isn’t dependent on the thermostat that controls the rest of your house. And they’re energy-efficient—an electric radiant floor in an average bathroom uses the same amount of energy as three 100-watt light bulbs. -When a heated floor is turned off it still generates heat especially when the floor is made of a dense material like concrete. Ceramic tile in a bath or mud room is a good choice for an electric radiant floor because it’s a great conductor of heat. Most radiant heat systems can also be installed under hardwoods. -Maximize outdoor space with a deck, patio or rock garden. A simple berm planted with native plants and flowers creates an area of interest. Laying stone or brick is more than a DIY project for most homeowners. Consult an outdoor or gardening specialist. Select trees and shrubs that provide shade. Providing shade for an outdoor space is key to enjoyment on hot, sunny days. -Railroad ties define sections of a yard or hold back erosion on a hill or alongside a driveway. Conserve on watering with flowering plants that retain moisture like lilies and deep root plants and trees. -Try a terrace. When you build layers into a hill you can retain moisture and prevent water run-off. Place large stones around trees to trap moisture. By creating condensation, you’ll have a natural drip irrigation system. Going green doesn’t necessarily require complex or expensive products or hard-to-find features. Instead, it can be the right solution for reducing energy costs and optimizing comfort for you and your family. Home/Eco-Home — Is Electric Radiant Floor Heating Good for the Environment? Summer can wreck havoc on your home, both outside and in. Soaring temperatures and high humidity cause surfaces to crack, chip and separate, contribute to dust, dirt and debris build-up, and create a breeding ground for harmful bacteria, mold and mildew. With the season winding down and fall just around the corner, now is the time for homeowners to get ready for the cooler months and avoid potentially costly fixes down the line. Give outdoor areas a good general cleaning then inspect them for signs of damage or deterioration. Repair holes and cracks in wood with a quality epoxy-based filler. For brick and stone surfaces, use the proper mortar or sealant to keep damage to a minimum. Sand or scrape flaking or chipping paint or stain, then recoat the surface before fall rains arrive to keep moisture at bay. Fill any cracks in your paver, concrete or asphalt driveway, walkways and paths to minimize trip hazards and prevent the coming rain (and eventual snow and ice) from causing more damage. For concrete cracks less than a half-inch wide, run a bead of acrylic latex repair compound into the seam then smooth with a putty knife. For larger cracks, trowel on a vinyl concrete patching compound and let it cure (a full day before foot traffic; three days for vehicles). Repair blacktop with asphalt filler or patch. And remember to always start with a clean, dry surface. Use latex or silicone caulk to seal gaps larger than ⅛ inch around windows and doors to keep the elements out and reduce your seasonal heating bill by up to 15 percent. Use foam weather-stripping on the sides and top of doors, and install a door sweep on the bottom to keep drafts out. For windows, use adhesive-backed closed-cell foam on the bottom of the sash. For looses sashes, install plastic V-channel weather-stripping in the groove the sash fits into, then secure it with finish nails. Leaky gutters and overflow due to debris clogs can result in water damage to the foundation and basement or crawlspace walls. So, Take a good look at the gutters and downspouts and repair problem areas with a waterproof sealant. 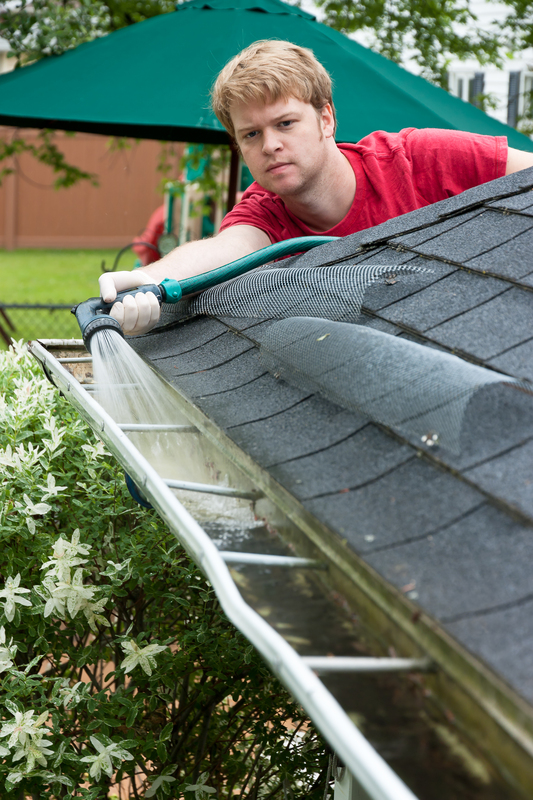 Check your roof for leaks and water damage before the rainy season to keep minor issues from becoming major ones. Address small roof leaks with tri-polymer elastomeric sealant in a caulk tube. From inside, inspect the attic on a bright, sunny day or during a steady rain to look for rays of light or water infiltration. Thoroughly clean your stove and oven, being sure to use a degreaser to remove any build-up from the range hood or vent fan. Vacuum behind and underneath the fridge to remove dust, dirt and pet hair from the coils, which can interfere with performance. Check the washer to make sure that it is level and plumb, and clean the dryer vent of accumulated lint with a long-handled brush. Summer humidity causes moisture that spawns bacteria, mold and mildew on dusty air filters. Wash your reusable HVAC filter and leave it to air dry in the sun. For disposable furnace filters, buy a replacement at your local home improvement or hardware store (be sure to write down the size printed on it) or order an upgrade—a hypo-allergenic, mildew resistant filter—online. Pathogens tend to build up faster in bathrooms during the humid summer months. Use a strong soap scum remover on your sink, tub, tile and shower surfaces. Spray any mold or mildew with a bleach-based killer (or 10 percent bleach solution—1¼ cup of household bleach per gallon of water). Allow cleaned grout to dry completely then repair any cracks with new grout or reseal with silicone caulk. Pour garbage disposal cleaner down the drain to remove small clogs and disinfect the line. Tackle any food stains or rust in the sink with bleach or a calcium, lime and rust remover. Take out the dishwasher filter and soak it in warm, soapy water for 15 minutes. After replacing it, add two cups of distilled white vinegar to the bottom of the dishwasher and run it empty for one heavy cleaning cycle.